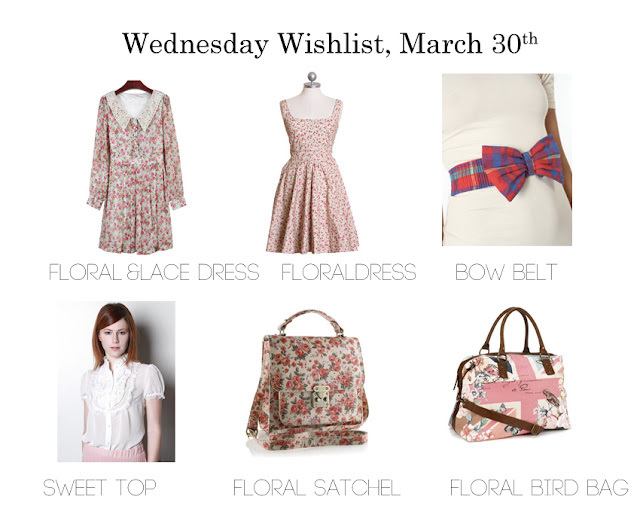 Tulle & Combat Boots: wednesday wishlist: florals, florals, more florals. wednesday wishlist: florals, florals, more florals. Okay, so it's becoming really obvious that I want spring. Now. And I know the entire blogosphere is freaking out (in a good way) about the season change, and okay, I'm one of those people. I'm just excited to wear dresses without a ton of layers! Anyways, today's wishlist definitely shows my spring lust. I want both of the bags so much! Also, I'm in LOVE with my bow belt. It goes with everything! It's totally worth it and you SHOULD finally get one. Aren't they both so pretty?! I think I may finally buy it, haha. It's so cheap! I love the floral dress! I would like one of my own! I don't think I have enough florals! You can really never have enough florals in my opinion!